It seems 2019 some wishes are granted! 2015 Los Angeles based artist Yoskay Yamamoto presented his final design for his sculpted entitled Wish Upon Me… Paying homage to America in the style and colour of the personality Evel Knievel, this minimalist design which featured a hand crafted cape. 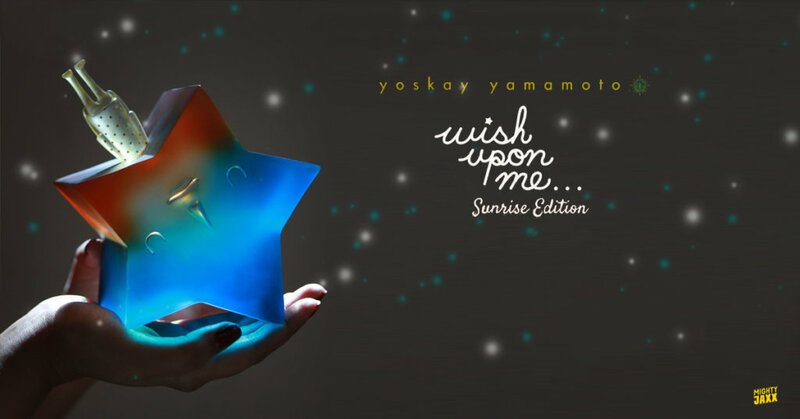 Fast forward to 2019 and it looks like its a total U-Turn as the return of the READY to ship Yoskay Yamamoto x Mighty Jaxx “Wish Upon Me….” This Sunrise edition will be the first in the series made from clear resin! Wake up to beautiful hues of turquoise and tangerine and gold. Mighty Jaxx http://mightyjaxx.rocks/ Facebook , Twitter and Instagram.